Do Guns Reduce Crime? The Supreme Court's ruling this summer that the Second Amendment protects an individual's right to bear arms has added fuel to the ongoing national debate about guns. 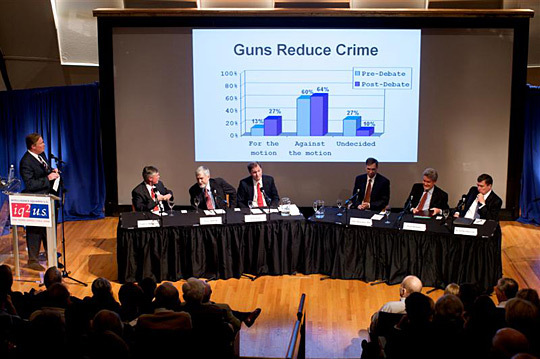 A panel of six experts takes on the proposition "Guns Reduce Crime" in an Intelligence Squared U.S. debate. Panelists hear the results of the audience's vote after the debate. On Nov. 18, panelists debate the proposition "Google Violates Its 'Don't Be Evil' Motto." The Supreme Court's ruling this summer that the Second Amendment protects an individual's right to bear arms has added fuel to the ongoing national debate about guns. 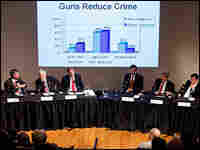 Recently, a panel of six experts took on the proposition "Guns Reduce Crime" in an Intelligence Squared U.S. debate. The series is based on a program that began in London in 2002. It pits experts on either side of an issue against each other in Oxford-style debates. At the beginning of the Oct. 28 debate, moderated by John Donvan of ABC News, 13 percent of the audience voted in favor of the motion, while 60 percent voted against; 27 percent were undecided. By the evening's conclusion, those voting in favor of the motion increased to 27 percent. However, 63 percent disagreed that "Guns Reduce Crime," and 10 percent were still undecided. Stephen Halbrook, attorney for the National Rifle Association and author of The Founders' Second Amendment. Gary Kleck, a professor in the College of Criminology and Criminal Justice at Florida State University and author of Targeting Guns: Firearms and Their Control. John R. Lott, a senior research scientist at the University of Maryland and author of Freedomnomics: Why the Free Market Works and Other Half-Baked Theories Don't. John J. Donohue, the Leighton Homer Surbeck professor at Yale Law School. Paul Helmke, president of the Brady Campaign/Center to Prevent Gun Violence. R. Gil Kerlikowske, Seattle chief of police.